Follow these safety tips for backyard and patio grilling. At the store: Select meats, poultry and fish last when shopping and go straight to the checkout after putting them in your cart. Make sure raw meats, poultry and fish are in a separate area of the cart and/or in plastic bags. On your way home: Make sure raw meats, poultry and fish are in a separate shopping bag from other grocery items to prevent juices from spilling onto other foods. Plan to head straight home after shopping. If you have a long way to drive you may want to bring a cooler. Storing foods at home: Put meats, poultry and fish into the refrigerator or freezer within 2 hours of when you pulled them from a cold shelf at the grocery store or within 1 hour in temperatures above 90 degrees. If you won't use poultry, fish, ground meat, or variety meats within 1 or 2 days, freeze them. For other beef, veal, lamb and pork, freeze within 3 to 5 days. Thawing: Safely thaw frozen foods in the refrigerator, not on the counter. If you'll be grilling right away, you can use the microwave for quicker thawing. Marinating: Marinate in the refrigerator, not on the counter. Marinate poultry and cubed meat for as long as 2 days. Beef, veal, pork, and lamb roasts, chops, and steaks may be marinated up to 5 days. If some of the marinade will be used as a sauce, set aside a portion of it before putting raw meat in the rest of the marinade. If you do use marinade on food that has come in contact with raw meat, poultry or fish make sure to boil it first to destroy any harmful bacteria. Hands that touch food should always be clean hands. Keep food cold up until you put it on the grill. Take meats, poultry and fish directly from the refrigerator to place them on the grill. Do not use the same plates, platters, utensils or surfaces for raw meat, poultry and fish preparation that you use for cooked foods. Or, clean well with hot soapy water between uses. Remember, separate - don't cross contaminate. Cook food to a safe internal temperature throughout (see photo). Use a food thermometer. Click this link (leads to another Food Hero tip) to see safe temperatures per food item. 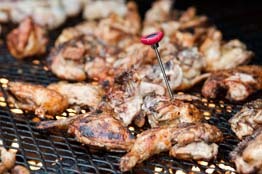 Serving: When taking foods off the grill use clean utensils and put them onto a clean plate or platter. Leftovers: Food should never sit out (at room or outdoor temperature) for more than 2 hours or 1 hour in temperatures above 90 degrees. Refrigerate foods in shallow containers as soon as you are done eating. Throw out foods that have been left out too long. Adapted from the USDA handout "Barbeque and Food Safety," May 2011 version.